Congratulations to the Institute for Advanced Composites Manufacturing Innovation (IACMI) and LIFT-Lightweight Innovations for Tomorrow on the opening of their facility in Detroit. C. A. Litzler Co., Inc. is proud to have supplied a Pilot Prepreg Machine to Michigan State University that was installed at the IACMI Vehicles Technology Scale-up facility in Corktown, MI late this summer. IACMI is part of a national network of research institutions and industrial companies geared toward advancing America’s leadership in manufacturing technology. 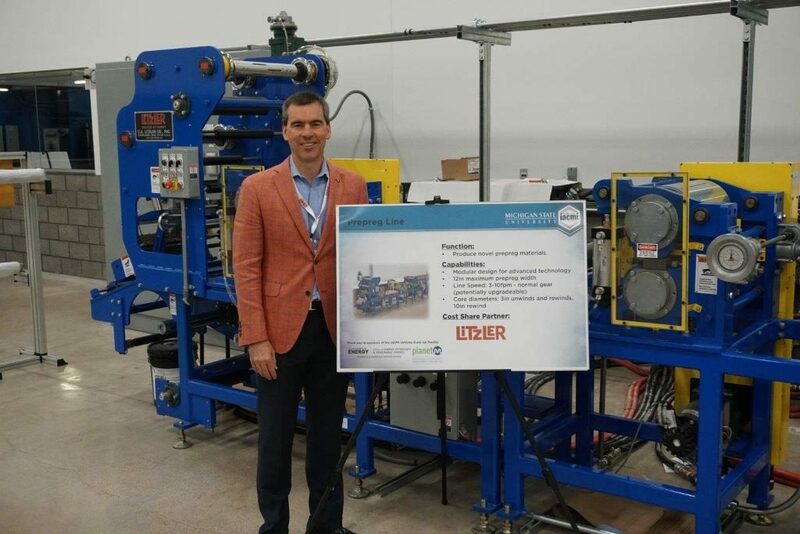 Litzler’s Hot Melt Prepreg Machine will help speed development of new lightweight composite manufacturing processes for use in the automotive market. The machine is capable of manufacturing UD and fabric thermoset prepregs including resin application and impregnation. The machine features exclusive Litzler compaction rolls and a Litzler Automation control system.